Reading and share top 19 famous quotes and sayings about Self Centred by famous authors and people. Browse top 19 famous quotes and sayings about Self Centred by most favorite authors. 1. "Why were there no words that spoke positively about being concerned about the self? Why was there only negative connotation in terms like "selfish", "self-interested", "self-centred", "self-obsessed" and so on? Why was it so much better to be without a self: "selfless", "self-sacrificing", "self-effacing", etc?" 2. "At the evident risk of seeming ridiculous, I want to begin by saying that I have tried for much of my life to write as if I was composing my sentences to be read posthumously. I hope this isn't too melodramatic or self-centred a way of saying that I attempt to write as if I did not care what reviewers said, what peers thought, or what prevailing opinions may be." 3. "My dad was such a bigot. He was a horrible, self-centred person. He was really racist and he'd talk about the Jews and blacks and Catholics even." 4. "I am self-centred. I just adore myself." 5. "She sometimes wondered what her twenty-two-year-old self would think of today's Emma Mayhew. Would she consider her self-centred? Compromised? A bourgeois sell-out, with her appetite for home ownership and foreign travel, clothes from Paris and expensive haircuts? Would she find her conventional with her new surname and hopes for a family life? Maybe, but the twenty-two-year-old Emma Morley wasn't such a paragon either: pretentious, petulant, lazy, speechifying, judgemental. Self-pitying, self-righteous, self-important, all the selfs except self-confident, the quality that she had always needed the most." 6. "Racing is a very selfish, self-centred, self-glorifying thing. My wife's life for 14 years was centered around me. It was all about me. It was all for my ego." 7. "I hurt myself deeply, though at the time I had no idea how deeply. I should have learned many things from that experience, but when I look back on it, all I gained was one single, undeniable fact. That ultimately I am a person who can do evil. I never consciously tried to hurt anyone, yet good intentions notwithstanding, when necessity demanded, I could become completely self-centred, even cruel. I was the kind of person who could, using some plausible excuse, inflict on a person I cared for a wound that would never heal." 8. "We need to return from the self-centred concept of sincerity to the other-centred concept of truth. We are not isolated free choosers, monarchs of all we survey, but benighted creatures sunk in a reality whose nature we are constantly and overwhelmingly tempted to deform by fantasy. Our current picture of freedom encourages a dream-like facility; whereas what we require is a renewed sense of the difficulty and complexity of the moral life and the opacity of persons. We need more concepts in terms of which to picture the substance of our being; it is through an enriching and deepening of concepts that moral progress takes place. Simone Weil said that morality was a matter of attention not of will. We need a new vocabulary of attention." 9. "Rogers believed that we have within ourselves enormous potential for self-understanding and for altering our self-concept and for our behaviour. He believed that this potential can be tapped if a climate of facilitative psychological attitudes can be provided, which person-centred therapy aims to do"
10. "Beyond all explanations which a good brain can give, why do we choose the worse and not the better, why hate rather than love, why greed and not generosity, why self-centred activity and not open total action? Why be mean when there are soaring mountains and flashing streams? Why jealousy and not love? Why?" 11. "Leadership is essentially an other-centred activity not self centred one"
12. "The primary value in value-based leadership is other-centredness - to be more concerned about other people and the organization than oneself. So in other words, the leader's job is to fulfil the agenda, the role, and the vision of the organization, not his personal agenda. All the great leaders in the world are other-centred. The self-centred leader will derail in due course But still, to be other centred is not enough." 13. "A sentimentalist is one who delights to have high and devout emotions stirred whilst reading in an arm-chair, or in a prayer meeting, but he never translates his emotions into action. Consequently a sentimentalist is usually callous, self-centred and selfish, because the emotions he likes to have stirred do not cost him anything." 14. "We think of ourselves as failures, rather than renounce our belief in the possibility of perfection. We hang on to the hope of eternal love by denying even its temporary validity. It´s less painful to think 'I'm shallow', 'She's self centred', 'We couldn't communicate', 'It was all just physical', than to accept the simple fact that love is a passing sensation, for reasons beyond our control and even beyond our personalities. But who can reassure himself with his own rationalizations? No argument can fill the void of a dead feeling -- that reminder of the ultimate void, our final inconstancy. We're untrue even to life." 15. "I always feel so pretentious talking about comedy and deconstructing it. It always feels somehow self-centred to talk about any sort of process." 16. 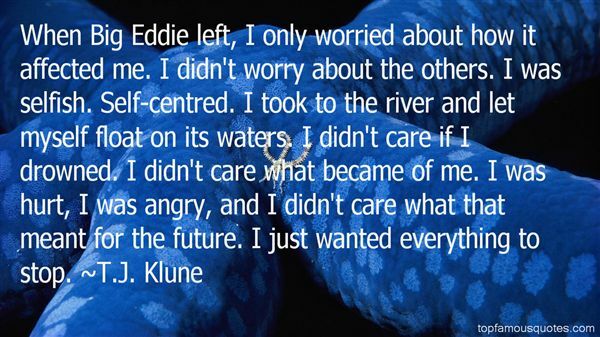 "When Big Eddie left, I only worried about how it affected me. I didn't worry about the others. I was selfish. Self-centred. I took to the river and let myself float on its waters. I didn't care if I drowned. I didn't care what became of me. I was hurt, I was angry, and I didn't care what that meant for the future. I just wanted everything to stop." 17. "What Althusser does… is to rethink the concept of ideology in terms of Lacan's ‘imaginary'. For the relation of an individual subject to society as a whole in Althusser's theory is rather like the relation of the small child to his or her mirror-image in Lacan's. In both cases, the human subject is supplied with a satisfyingly unified image of selfhood by identifying with an object which reflects this image back to it in a closed, narcissistic circle. In both cases, too, this image involves a misrecognition, since it idealizes the subject's real situation. The child is not actually as integrated as its image in the mirror suggests; I am not actually the coherent, autonomous, self generating subject I know myself to be in the ideological sphere, but the ‘decentred' function of several social determinants. Duly enthralled by the image of myself I receive, I subject myself to it; and it is through this ‘subjection' that I become a subject." 18. "Music is the worst of them - roiling and boiling - overly emotionalized on the one hand, overly intellectuallized on the other. Bach and Mozart indeed! Bach inevitably makes me think of fish in a barrel! round and round and round they go and nothing ever happens. Nothing ! Tum -de-dum-dum. Tum -de-dum-dum and that's all! Tum -de-dum-de-bloody-dum-dum! As for Mozart, his emotions did not mature beyond the age of twelve. never achieved adolescence, let alone puberty. his music merely combines a popular talent for slapstick and a commercial talent for tears. No - not tears. For sobs. Beethoven, pompous. Chopin - sickly sweet and given to tantrums - Tum -de-dum-dum- Bang! and Wagner - a self -centred bore. and Stravinsky - discordant, rude and blows his music through his nose"
19. "PatriotismBreathes there the man with soul so dead, Who never to himself hath said, 'This is my own, my native land!' Whose heart hath ne'er within him burn'd As home his footsteps he hath turn'dFrom wandering on a foreign strand? If such there breathe, go, mark him well; For him no Minstrel raptures swell; High though his titles, proud his name, Boundless his wealth as wish can claim;Despite those titles, power, and pelf, The wretch, concentred all in self, Living, shall forfeit fair renown, And, doubly dying, shall go down To the vile dust from whence he sprung,Unwept, unhonour'd, and unsung." The smallest number, with God and truth on their side, are weightier than thousands."